As long-time readers know – for the lesser known characters in books I review, I try to give a little background on the character. This one poses a bit of a weird origin. 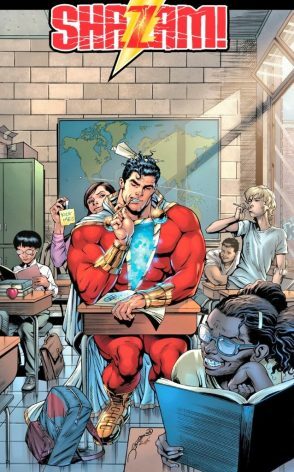 The book is called Shazam. The character is technically called Captain Marvel. No, not that Captain Marvel. You see, back in the 70s or so, Marvel and DC had a bit of a legal tiff. Thus DC could not use the Marvel name in any of its books. This became moot with the New 52 version of Shazam where Geoff Johns got rid of the reference to Captain Marvel entirely. He only references the character as Shazam. Confused yet? Me neither. The concept of this character is cool. He’s not a mutant. Also not an alien. Pure magic transferred from a dying wizard. A bit of fresh air really. You get into the book and find that this is the teen version of the Justice League. For those of us that didn’t read the previous incarnations of the character, the first bit is a little confusing. The writer could have taken a bit more of a breath explaining why the “team” exists. However, as it turns out, the action gets going immediately and it’s only a minor glitch in the story. As far as comics go, this story is pretty much by the numbers resulting in a pretty entertaining book. Where the surprise comes in is the second story. The story itself is a cutesy look at a couple of the minor characters and a bit of origin for them. But the art is so darn sweet. Mayo “Sen” Naito has a clear anime style. And it’s a pretty abrupt change from the main story albeit a welcome one. If you’re looking for something different in the DC world this could be for you. If you are looking for a book that’s not as mature and dark as DC tends to be – this could be a great jumping on point for you or any younger reader.